Jean-Antoine Houdon (1741-1828) was the best portrait sculptor of his time and perhaps of all time. Nevertheless he was lucky to live in an age of giants rather than pygmies. His busts and statues palpably portray the men whose ideas and leadership created the modern world and the American nation: the philosophers of the Enlightenment: Denis Diderot, Voltaire, Jean-Jacques Rousseau, and the founders and early heroes of the United States: Benjamin Franklin, George Washington, Thomas Jefferson, Lafayette, John Paul Jones and Robert Fulton. When we visualize one of these heroes, we are almost always referencing Houdon's brilliant portraits. 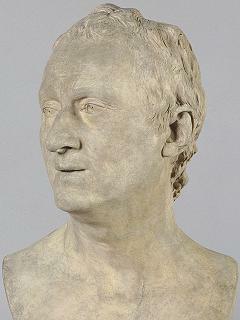 Between 1775 and 1789 he sculpted the men of letters and of the nobility of Europe and America. Despite the ubiquity of his busts and statues, especially in Paris and Washington, "Jean-Antoine Houdon: Sculptor of the Enlightenment" is the first international exhibit of his work. Heroes are "hot" right now in America, whether they are firemen, soldiers or amateur singers. This show bring us face to face with some of the noblest heroes of thought and action that the modern world has ever known; men whose faces project the vision and determination to reject the bad old ways of Europe and build a new society in the new world. Houdon was the son of the concierge of the Ecole royale des eleves protégés; thus he grew up "at the feet of the Academy". He won a Prix de Rome, the prestigious competition whose prize was a scholarship at the Académie de France in the eternal city, allowing him to study works of classical antiquity as well as the architecture and statuary of Renaissance giants such as Michelangelo. Houdon soon learned to combine Roman realism with Greek idealism in marble and clay. 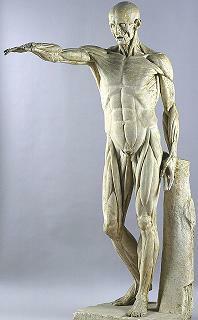 The first notable product of this education was l'Écorché [see right], a life-size figure of a flayed man that demonstrated his masterful understanding of human anatomy and his ability to represent it so accurately that it could serve as a model for future art students. The grace and the awesome classical proportions of this statue surpass anything one sees in today's fitness-crazed world. Multi-tasking in marble, plaster, bronze, clay and terra cotta, the young sculptor returned to Paris determined to become the leading portrait artist of his age. He first courted the nobility of Germany and France - but these princes were soon eclipsed by the real stars of the time, the literati and the glitterati. Notable works in the exhibits include busts of the writer La Fontaine, the playwright Molière and the composer Gluck, as well as many glamorous actors and singers of the Parisian stage. Always alert to the hidden sources of power, Houdon modeled the heads of the philosophers behind the Encyclopedia: Diderot (see lower right), d'Alembert and Buffon. Only Jean-Jacques Rousseau refused to sit for the artist. Yet when Rousseau died, Houdon was the obvious choice to make the death mask (not in the exhibit), which in turn served as the source for a bust of the author of The Social Contract and the Emile. According to one contemporary, Rousseau's eyes were so piercing that "they seem to penetrate into the most hidden innermost folds of the human heart!" 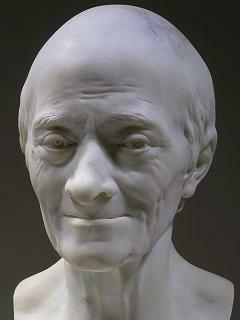 Houdon's ability to "do" eyes stunned viewers in the 18th century as it will today's audiences. He was the first sculptor in the history of art who knew how to render the way eyes capture the light. How did he do it? He first cut out the entire iris, and then bore a deeper hole for the pupil, taking care to leave a small fragment of marble to overhang the iris. The effect is a vivacity and mobility of expression unrivalled in the long history of portrait painting or sculpture. In a few sittings, Houdon grasped the expression that captivated contemporaries. The weary face, with its sagging neck and toothless mouth, nevertheless radiates intense mental and spiritual vitality. Penetrating observation, mocking humor, and sorrow show in the lined eyes, lifted brows, and compressed smile. Voltaire's face epitomizes the quality so often implied in eighteenth-century portraiture -- quick, biting wit. Voltaire died soon after, on May 30, 1778. It was Houdon's genius to be able to capture this brilliant intellectual by means of the lips, the eyes. He brought this same ability to his portraits of the founders of the American experiment in self-government. Houdon knew Benjamin Franklin, and through him came to know Lafayette and Thomas Jefferson. Jefferson was serving as American minister to France when he sat for Houdon. The resulting marble was the most recognizable and enduring image of Jefferson. It was the source of the presidential portrait on the 1801 Indian Peace Medal, for the Jefferson dollar (minted in 1903) and for the nickel that was first issued in 1938 and is still in circulation today. When the first Congress and the Virginia legislature desired to recognize George Washington's extraordinary contributions to the nation by erecting a monument in the state capitol, Jefferson recommended Houdon. General Washington had never been to Europe, and Houdon insisted he needed to study Washington from life. Before the age of air travel, the sculptor was one of the very few European artists who actually made the trip to North America, spending several weeks in 1785 at Mount Vernon working on the statue that he considered the most important commission of his career. Houdon's marble bust, which established the primary iconography for Washington in Europe and America, is a masterpiece of introspection and soulfulness that offers us a much-needed third dimension to the image of the father of our country which we get from the Gilbert Stuart paintings. Finally, not to be overlooked are the astonishing portraits of children in this exhibit. The 18th century discovered the enchanted world of childhood. One can imagine Houdon, having Rousseau's "Emile" read to him while he is working on these much loved pieces of his children and the children of his clients - works that transcend the sentimental categories of the past with their alert intelligence and fragility of innocence. The excellent catalogue prepared by Anne L. Poulet provides brilliant essays on each of the figures in the exhibit. It is a model of how art history can be used to illuminate the events, ideas and personalities of the modern world. National Gallery of Art in Washington, D.C. through September 7, 2003. J. Paul Getty Museum in Los Angeles, November 4, 2003 through January 25, 2004. Musée et domaine national du chateau de Versailles near Paris, March 1 through May 30, 2004.